€500mln station flooded after rainstorm. Unsealed ceiling? Water passed through the windowed rood of the station, built just two years ago. Many of these were open when the rain started, passengers claimed. 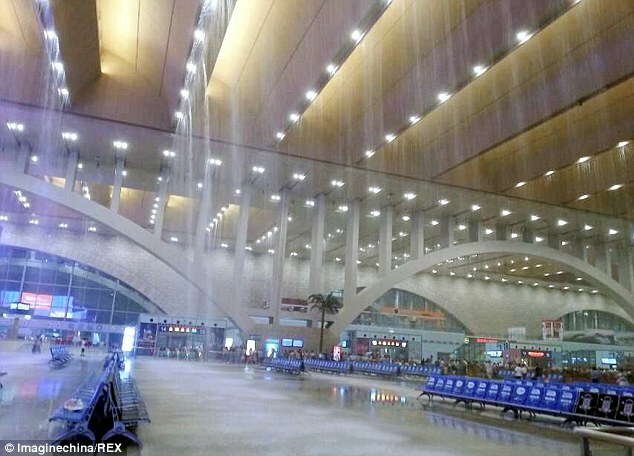 A newly built Shijiazhuang railway station, costing the city over €500 mln, was transformed into a beautiful giant waterfall after the ceiling failed to stop leakage during a heavy rainstorm. Web users who uploaded images of the station online said that service was nearly all paralyzed, as most trains were stuck at Zhengding Airport Station. The Shijiazhuang area suffered from torrential rainfall, resulting in suspended service from the Shijiazhuang to Huolu section of the Shitai Line. Some web users attributed the water leakage to the design of the station. In an attempt to save energy, the building takes advantage of natural lighting with a windowed roof. It’s hard to cover all the windows in a timely manner, however, if heavy rain or a typhoon approaches, allowing water to pour inside the lobby. The station apologized for the inconvenience caused by the rainstorm and cleaned up the station overnight. Alstom’s Citadis Compact The ERTMS/ETCS free handbook. Download it for free in PDF format!